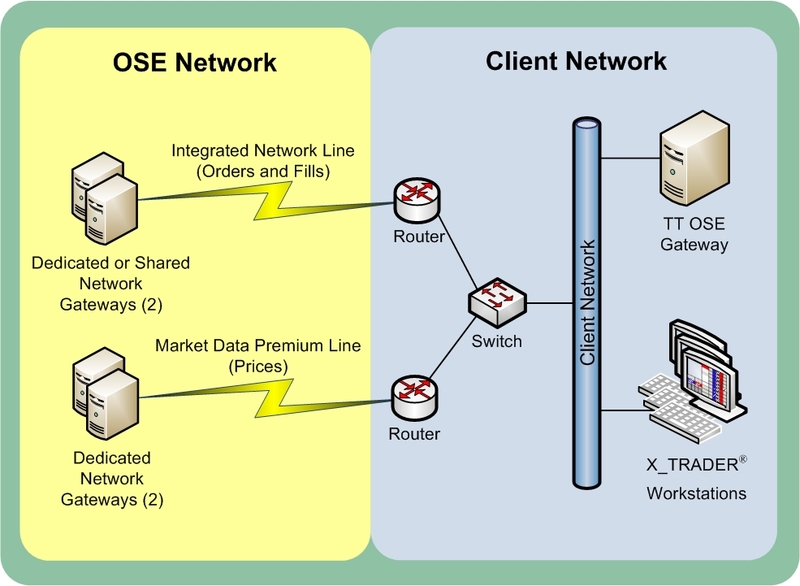 You can connect to OSE by establishing a proximity connection at the customer site, setting up a co-location environment, or setting up a combination of Integrated Network lines for Order connection and Market Premium Direct connection lines for the Price connection. OSE provides Network Gateways which act as access points to the central system. The maximum number of users allowed per Designated Network Gateway set is 40, regardless of user type. 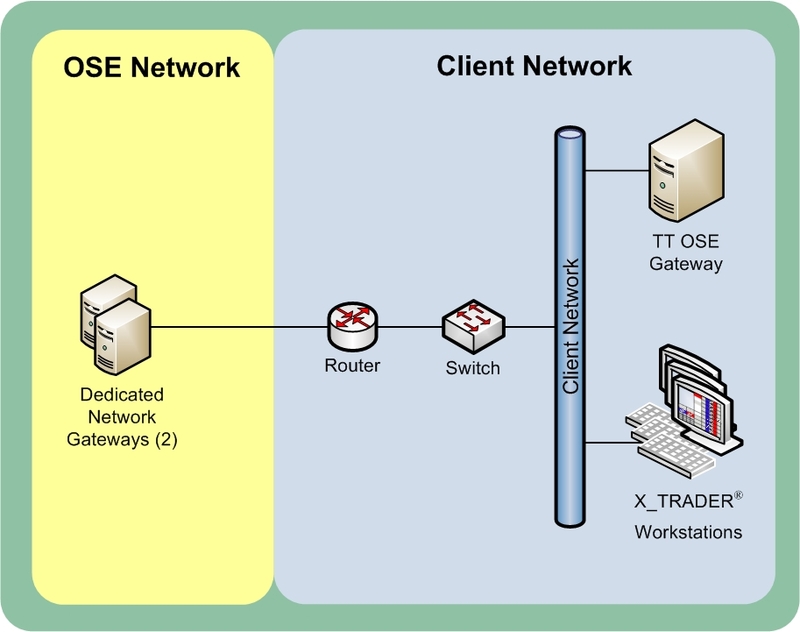 OSE assigns a Login ID for each Dedicated Network Gateway set. TT only supports Dedicated Network Gateway deployment for Price connections. For Order connections, customers can use Dedicated or Shared Network Gateways. Dedicated Network Gateways are used exclusively by one Membership, while Shared Network Gateways are shared by one or more Member Firms. In the hostinfo.cfg file, the IP address of the specific Network Gateway should be entered under each Login ID. 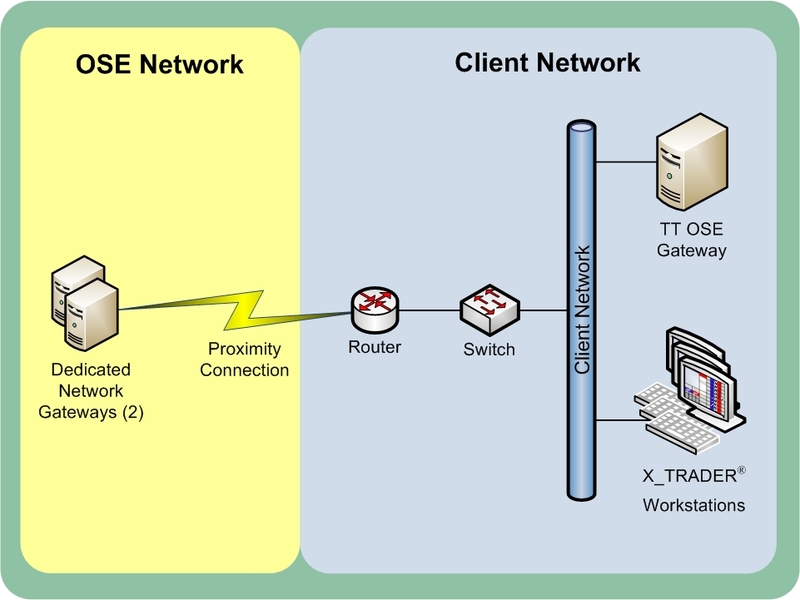 Multiple TT OSE Gateways can connect to a Dedicated Network Gateway set as long as the Price and Order credentials of the same Membership are used. Additionally, both the Price and Order Server can connect to the same Dedicated Network Gateway set. This configuration option requires a Dedicated pair of Network Gateways. Both Highly-Frequent Market Data and Trader users can be configured in the same Network Gateway. This configuration option requires a pair of Dedicated Network Gateways. Both Highly-Frequent Market Data and Trader users can be configured in the same Network Gateway. This configuration option requires either a pair of Dedicated Network Gateways or a pair of Shared Network Gateways connected to the Integrated Network Line for Orders and Fills. In addition, a pair of Dedicated Network Gateways is required to connect to the Market Data Premium Line for prices. In this deployment model, the originating IP address for the Price and Order connections must be different.